No one can deny that 2017 was an amazing year for the Backstreet Boys. There was the beginning of a quick-selling Las Vegas, which has now extended into this year with balcony seats being sold for the first time in Axis history, a #1 song on country radio, a first-time collaboration and a few dates on a Summer stadium tour...and that’s just to name a few things. Such a record year deserved to end with a party and that’s certainly what Kevin, Howie, Brian, AJ, and Nick delivered on their two-night stint in Cancun, Mexico this past weekend. After selling out the first night almost immediately, the group added a second show to accommodate the high demand and to make sure that all of the fans who wanted to come got a chance to end the year right. 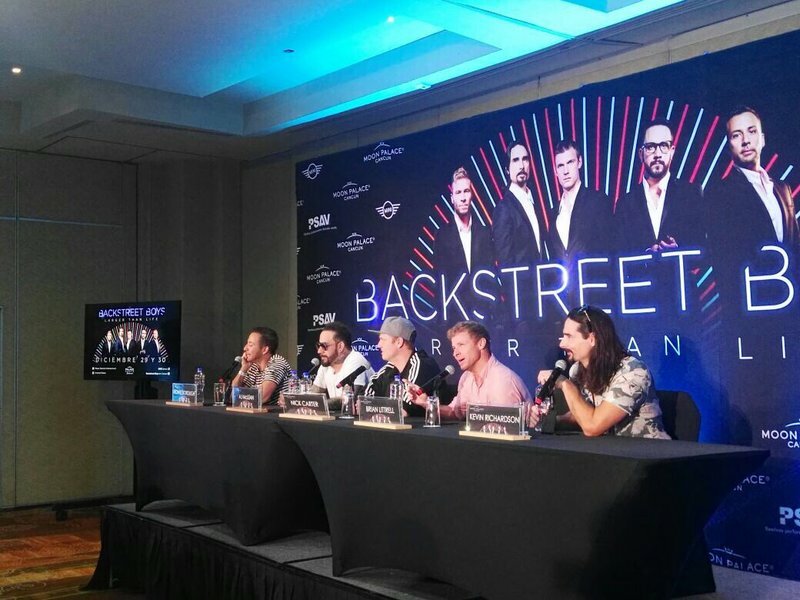 “I just want to say how much we love Mexico and how much our fans here mean to us,” Nick said before answering a question at a press conference on Friday prior to the show. AJ added that the Backstreet Boys have “the most amazing fans and loyal fans” as a reason for their music standing the test of time. You can watch more of the press conference from Cancun here. If you met the Boys in Cancun and you haven’t seen your VIP photo yet, you can find them here. If you missed the chance to see the Backstreet Boys anywhere in 2017, don’t worry! There’s going to be plenty of opportunities to see them this year, including Las Vegas, which begins again on January 30th, and on their SOLD OUT cruise in May. There’s also a new album to be released, a world tour on the horizon, and a 25th anniversary to be celebrated! Are you excited yet? Keep up with all of the latest official BSB info only at backstreetboys.com. FANCLUB MEMBERS: If you’re looking to see the Boys in Vegas in 2018, this is the contest for you. One lucky member will be starting their year right by winning two BSBVegas pit tickets, two VIP Meet and Greet passes, and two Ultimate Afterparty passes to the show of your choice. If this sounds like something you’re interested in…HURRY! You have less than 2 weeks to enter to win this incredible package. If you aren’t a Fan Club member yet, digital memberships are available here. This is one year you don’t want to miss.